Credits: "Hannah Morgan on Unsplash.com​"
Vitamin D, also known as “the sunshine vitamin,” is one of the most well-known nutrients. Why? Much of this is because vitamin D is a unique vitamin that is supplied to our bodies by the sun’s ultraviolet type B (UVB) rays. Although we call it a vitamin, vitamin D acts much like a hormone in our bodies. Its basic structure comes from the cholesterol molecule, and it is categorized as a steroid molecule. Its complex activation process is described below. The specific physiology of achieving active vitamin D consists of an intricate process involving various organs – namely the skin, liver, and kidneys. The majority of vitamin D is synthesized in our skin. Additionally, vitamin D may be acquired through the diet from a few plant sources. This plant source of vitamin D is known as vitamin D2, or ergocacliferol, which is an inactive form of vitamin D and may be taken as a supplement. Whether acquired from diet, sunlight, or supplements, vitamin D eventually reaches our bloodstream. The outer layer of the skin, called the epidermis, produces a form of vitamin D called 7-dehydrocholesterol. When exposed to adequate UVB sunlight, 7-dehydrocholesterol is converted into a molecule known as “pre-vitamin D3,” which then undergoes a second molecular change and becomes vitamin D3, also known as cholecalciferol. The liver then converts vitamin D3 into a form of D3 known as 25-hydroxyvitamin D3, or calcidiol. The liver also converts the D2 form (plant derived) into calcidiol. From this step, calcidiol travels to the kidneys where it undergoes a final molecular change and becomes 1,25-dihydroxyvitamin D3 (1,25-(OH)2D3), or calcitriol, the most active form of vitamin D in the body. How Much UVB Exposure Is Enough? In short, the answer to this question remains: it depends. Vitamin D is one of the most scientifically studied nutrients. Much of this stems from the fact that there is strong variation in the requirement for adequate vitamin D levels amongst people of different populations and ethnicities. One of these differences is due to skin pigmentation. 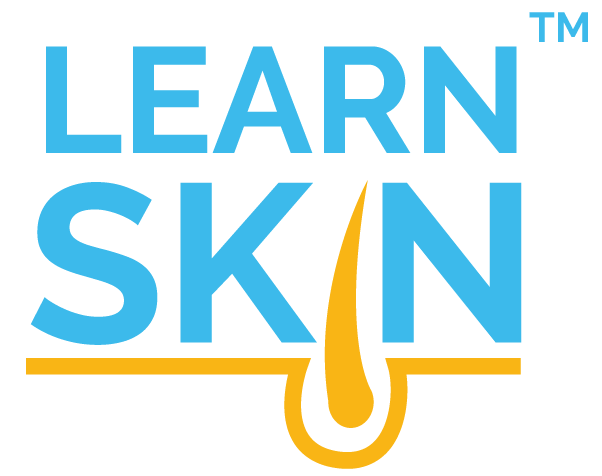 Increased skin pigmentation (darker skin) reduces the penetration of UVB rays required to begin the vitamin D activation process. This principle describes the reason why individuals with less pigment in their skin require much less time in the sunshine than someone who has darker pigment to make vitamin D.
One study questioned whether ethnicity, skin tone or some other factor was a major determinant of activated vitamin D levels in the body after controlled sunlight exposure. The results of the study showed that the measured baseline level of vitamin D, rather than skin tone or ethnicity, most strongly affected the amount of vitamin D activated in study participants. The investigators found that those who were deficient in vitamin D levels, regardless of ethnicity or skin tone, had a greater increase in vitamin D after ultraviolet light exposure. Exactly how much sunlight exposure is needed to adequately synthesize vitamin D depends on various factors. One of these factors is the time of day. Peak periods for synthesizing vitamin D are often promoted as between 10:00 am and 3:00 pm, although UV exposure may still be significant outside of this time frame. The skin contains a feedback mechanism that limits the amount of vitamin D activated by sunlight exposure so that active vitamin D does not surpass safe levels with prolonged sun exposure. This also means that at some point, more sun does not mean more vitamin D.
There are other factors that affect vitamin D levels. The amount of sunlight (UVB penetration) during a given day depends on both season and latitude. 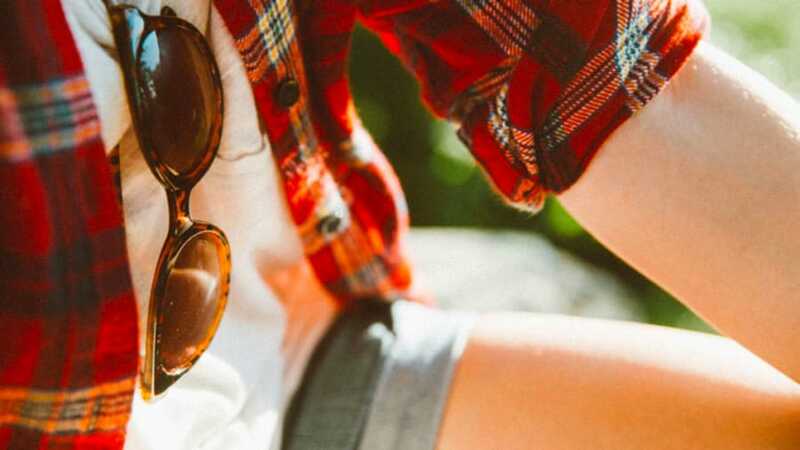 In addition, the amount of skin exposed to the UV rays influences how much vitamin D can be activated, which is often influenced by clothing choice. [6,7] One study found that individuals in inner-city dwellings resulted in lower vitamin D activation than it did in those living in rural areas. The exact reasons are not clear, although cities may have more buildings that can block sunlight and increased pollution that may decrease UVB exposure. Regular use of sunscreen is not thought to cause vitamin D insufficiency, although it does limit the amount of UVB penetrance into the skin. With these extraneous factors accounted for, dramatic variation in vitamin D activation from UVB rays still exists among individuals. There are various causes that account for such inter-personal differences in active vitamin D levels. In addition to those mentioned previously, these causes include age, differences in how vitamin D can affect the skin’s cells, height, and natural skin color (in areas that are not tanned). Due to the wide variation in population levels and requirements, general recommendations are difficult to set. Much more research is needed in order to continue investigating this topic. What Conditions Does Vitamin D Help? Since vitamin D acts more like a hormone in the body, a wide variety of disorders are affected by vitamin D levels. One of the most well-known roles of vitamin D is in skeletal system metabolism. In another area, vitamin D is being researched for its ability to aid in insulin resistance and type II diabetes mellitus. Additionally, vitamin D has been shown to protect against risks of cardiovascular disease, chronic kidney disease, and various autoimmune disorders like multiple sclerosis and type I diabetes. Vitamin D plays vital roles in gastrointestinal biology and pathophysiology, and as such, vitamin D administration is now being explored as a therapeutic intervention for different gut disorders. Research supports vitamin D supplementation for individuals at risk for, or with already active gastrointestinal cancers. Vitamin D may also be helpful in improving gut barrier function in those with Irritable Bowel Disease (IBD) or other inflammatory bowel disorders. Because of what we know about the Gut-Skin Axis, there may be implications for vitamin D’s mechanisms in the gut to aid in skin health. In other health areas, the research is much less clear. There exists contradictory evidence to support vitamin D supplementation for the prevention of cancers. Scientists and physicians are exploring how vitamin D supplementation may aid in one’s response to chemo-radiation for cancers of the breast and lung. Other research supports the assessment of genetic variations of vitamin D receptors before the administration of vitamin D treatments in those with breast cancer. The role of vitamin D and UV irradiance in the treatment of skin disorders is an active area of research. Historically in dermatology practice, UV irradiance has been used to treat 34 documented skin conditions, as well as other conditions like tuberculosis. Today, a wide variety of inflammatory skin conditions, including psoriasis, are being studied for the use of UV-induced vitamin D as potential treatment, although this practice is already widely used. In the case of myotonic dystrophy, a rare genetic disorder that causes progressive muscle weakness, many patients have skin abnormalities, which correlate with serum vitamin D levels. A large number of studies have assessed the role of vitamin D in skin cancers, but no real consensus has yet been reached. Learn more about how to choose the best vitamin D supplement and what the difference is between vitamin D2 and vitamin D3. Reichrath J, Saternus R, Vogt T. Challenge and perspective: the relevance of ultraviolet (UV) radiation and the vitamin D endocrine system (VDES) for psoriasis and other inflammatory skin diseases. Photochem Photobiol Sci.2017;10.1039/c6pp00280cPMID: 28054069. Vitamin D: Two-Volume Set. 3 ed: Academic Press, 2011. Holick MF. 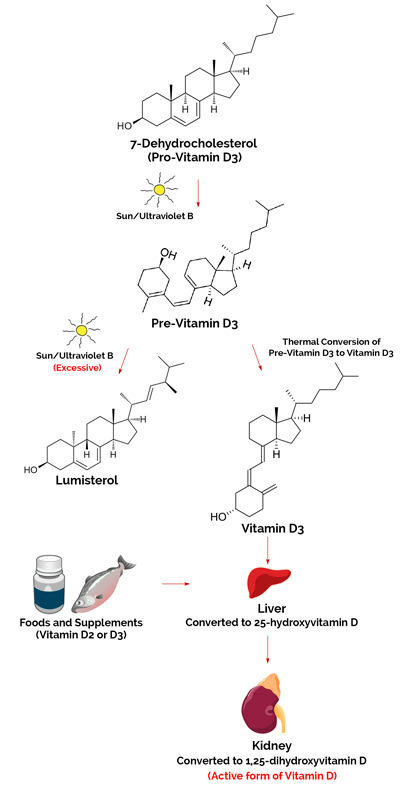 Photosynthesis of vitamin D in the skin: effect of environmental and life-style variables. Fed Proc.1987;46(5):1876-1882; PMID: 3030826. Hakim OA, Hart K, McCabe P, et al. Vitamin D production in UK Caucasian and South Asian women following UVR exposure. J Steroid Biochem Mol Biol.2016;164:223-229; PMID: 27016471. Stalgis-Bilinski KL, Boyages J, Salisbury EL, et al. Burning daylight: balancing vitamin D requirements with sensible sun exposure. Med J Aust.2011;194(7):345-348; PMID: 21470084. Sudhanshu S, Upadhyay P, Sahu M, et al. Sun exposure, UV irradiance and serum 25-hydroxycholecalciferol in pregnant women in rural north India. Public Health Nutr.2016;10.1017/S136898001600313X:1-5; PMID: 27989262. 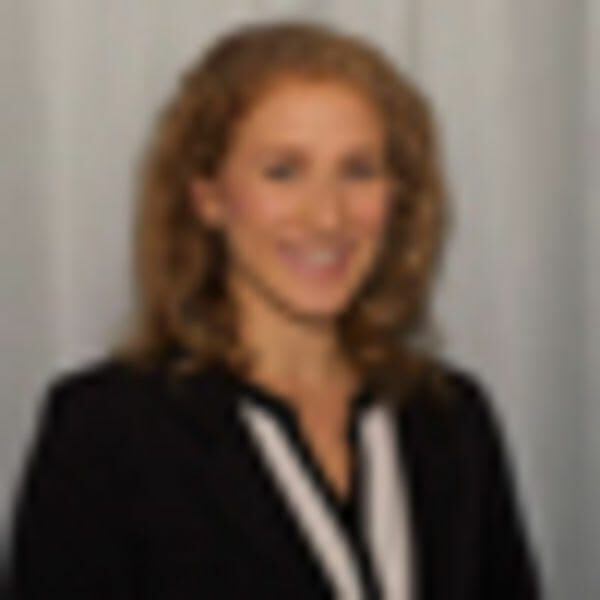 Datta P, Philipsen PA, Olsen P, et al. Major inter-personal variation in the increase and maximal level of 25-hydroxy vitamin D induced by UVB. Photochem Photobiol Sci.2016;15(4):536-545; PMID: 27001558. Diehl JW, Chiu MW. Effects of ambient sunlight and photoprotection on vitamin D status. Dermatol Ther.2010;23(1):48-60; PMID: 20136908. Uitterlinden AG, Fang Y, van Meurs JB, et al. Vitamin D receptor gene polymorphisms in relation to Vitamin D related disease states. J Steroid Biochem Mol Biol.2004;89-90(1-5):187-193; PMID: 15225770. Mackawy AM, Badawi ME. Association of vitamin D and vitamin D receptor gene polymorphisms with chronic inflammation, insulin resistance and metabolic syndrome components in type 2 diabetic Egyptian patients. Meta Gene.2014;2:540-556; PMID: 25606437. Morrison MA, Silveira AC, Huynh N, et al. Systems biology-based analysis implicates a novel role for vitamin D metabolism in the pathogenesis of age-related macular degeneration. Hum Genomics.2011;5(6):538-568; PMID: 22155603. Peppelenbosch MP, Fuhler GM, Verhaar AP, et al. Action and function of vitamin D in digestive tract physiology and pathology. Curr Med Chem.2016PMID: 28031008. Bjelakovic G, Gluud LL, Nikolova D, et al. Vitamin D supplementation for prevention of cancer in adults. Cochrane Database Syst Rev.2014;10.1002/14651858.CD007469.pub2(6):CD007469; PMID: 24953955. Sharma K, Goehe RW, Di X, et al. A novel cytostatic form of autophagy in sensitization of non-small cell lung cancer cells to radiation by vitamin D and the vitamin D analog, EB 1089. Autophagy.2014;10(12):2346-2361; PMID: 25629933. Reimers LL, Crew KD, Bradshaw PT, et al. Vitamin D-related gene polymorphisms, plasma 25-hydroxyvitamin D, and breast cancer risk. Cancer Causes Control.2015;26(2):187-203; PMID: 25421379. Jarrett P, Scragg R. A short history of phototherapy, vitamin D and skin disease. Photochem Photobiol Sci.2016;10.1039/c6pp00406gPMID: 27892584. Campione E, Botta A, Di Prete M, et al. Cutaneous features of myotonic dystrophy types 1 and 2: Implication of premature aging and vitamin D homeostasis. Neuromuscul Disord.2016;10.1016/j.nmd.2016.11.004PMID: 28065683. Deschasaux M, Souberbielle JC, Partula V, et al. What Do People Know and Believe about Vitamin D? Nutrients.2016;8(11)PMID: 27845705.